I don't have time to do a full review of this book, but I want to recommend it as a Christmas gift for anyone interested in World War II history. 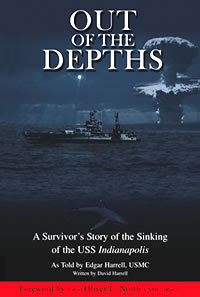 Out of the Depths: A Survivor's Story of the Sinking of the USS Indianapolis relates the personal experience of Edgar Harrell, one of only 300 survivors of the tragic sinking of the ship that had just delivered critical parts for the atomic bomb that was dropped on Japan in the waning days of the war. Written by Edgar Harrell's son, David, the story mixes scripture, first-person remembrances, and Harrell's description of events from the time the ship sank until he was picked up 4 1/2 days later. Harrell emphasizes his faith in the story because he believes it was that it was God's guidance and care that helped him survive his ordeal. To learn more or to buy the book, visit Harrell's Web site: http://www.indysurvivor.com/.